I have now used Windows Phone Mango and Nokia Lumia 800 more or less every day since the end of November. I’m mostly satisfied with them, but there are a few problems too. The first one is very bad multi-tasking. And I’m not talking about some geeky specifications, but real useability issues. Before Windows Phone I mostly used Symbian smartphones. Thay all had big problems, such as sluggish user interface and overall instability. But simple multi-tasking usually worked; I could leave apps running in the background and return to them later, as long as there weren’t too many applications running at the same time causing memory problems. The same does not apply to Windows Phone 7.5, at least not with Nokia Lumia 800. I am writing about this now, because I have a fresh example from just yesterday. I had Sports Tracker running in the background to record my walking route. When I arrived at the destination, nothing was stored, but instead a new session of the app launched without any data for yesterday. Apparently it had closed from the background or I had accidentally closed it myself. The problem is, in Windows Phone you can’t just switch between 3rd party apps by going to the main menu (Metro UI start screen), but instead you have to hold down the physical ”back” button for a few seconds, and then you switch to another apps from a visual view. The apps are left in a special frozen state with a minimal CPU and memory comsumption. In my experience this system is too complicated and awkward to use. The same has happened several times with many apps like Spotify, gMaps Pro, and many Finnish services (such as news apps for Helsingin Sanomat and Yle). I know Microsoft has chosen this kind a limited multi-tasking to save the battery, memory and CPU, but I think they should still optimize it for power users. Hopefully, maybe, this could even be improved with forth-coming firmware updates. I wouldn’t expect this to happen very soon, though. Many feel Windows Phone devices have even larger problems with bad battery performance, even though the latest firmware update at least for Lumia 800 is supposed to fix the issue to some extend. Maybe we’ll see more advanced multi-tasking with the next major release, Windows Phone 8 or whatever they call it. Some optimistic estimates say it would be coming after summer or at least by the end of this year. Microsoft has not confirmed the schedule, or whether it will become available for current Windows Phone devices. Update 18.3.2012 @ 22:16. According to technical documentation by Microsoft, the background in Windows Phone is supposed to work by bressing the Windows button too. In my opinion this does not change the point of unreliability of the background mode. You can judge yourselves, I am just more confused. There’ve been a lot of rumours and speculation about Windows Phone 7.5 (Mango) phones from Nokia after the leaked (?) video where Nokia’s CEO Stephen Elop showed a device looking like Nokia N9 running WP7. A couple of days ago there was a new video, apparently from some (Compal?) Chinese factory. This bad quality video shows some device opened and WP7 booting. This video has been removed from many sites “due to copyright claims by Nokia”, but there still are some copies on YouTube, such as this one embedded on PCMag.com. Windows Phone in Nokia X7 case. 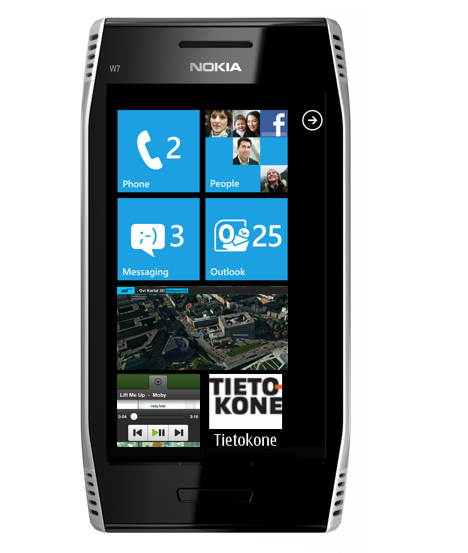 Could Nokia's WP7 Mango smartphone look like this? The big question is how much Nokia can differentiate from other Windows Phone vendors? At the moment Microsoft has a tight control over hardware specifications, physical buttons, screen size, user interface and so on. Stephen Elop and CTO Rich Green (at the moment on medical leave, according to WSJ) have claimed Nokia has agreed with Microsoft they can modify the platform with their own applications and UI enhancements. Then again, the famous Russian mobile blogger Eldar Murtazin said in an interview earlier this week the first WP7 Mango prototypes from Nokia would be no different from competitors from Dell, HTC, LG, Samsung, and others. So I put together a couple of thoughts how Nokia could and possibly will compete against other Windows Phone vendors. I call it unimaginatively Nokia W7. Physical sliding QWERTY keyboard similar to Nokia E7 and localised to different languages, such as Arabic, German, Nordic etc. This is the best keyboard I’ve used in a mobile device so far. Most WP7 devices currently don’t have a physical keyboard. Physical camera button (compulsory in all the Windows Phones, compare to Nokia N9 which lacks this). 4,0-inch capacitive AMOLED touch screen with 800×480 pixels (the only supported resolution at the moment). 8 or 12 megapixels. wide angle camera with Carl Zeiss optics, max aperture size of F2.2 (similar to Nokia N9), autofocus and Xenon flash. In my opinion Nokia E7 and N8 are a couple of the most stylished mobile devices at the moment with their aluminium unibody casing. I have dropped my N8 on different kind of floors many times, and it only has a couple of small scratches. The negative side is that the battery is under those screws and can’t be swapped easily. Nokia Maps “4.0” with free pedestrian and car navigation, maybe even with those nice 3D maps like in the web service? FOTA (firmware updates over the air). Data encryption for all the on-device data. Support for most Microsoft Exchange ActiveSync (EAS) policies for enterprise use. Full landscape and portrait mode support in UI, also in the main menu of WP7. I guess this won’t happen very soon unless Microsoft decides to support it. Obviously it should have decent multi-tasking, as all the Windows Phone Mango devices. I guess this won’t be a problem, since Microsoft has defined the mininum CPU and memory specifications. I have heard positive comments about multi-tasking from the users of Mango beta. I also hope to see Spotify, Skype and many other applications still missing from the platform. However, Nokia’s Rich Green said in an interview in February at MWC they are first focusing on getting Windows Phone smartphones to market as fast possible, and later we can expect modified UIs and other Nokia specific enhancements in the Windows Phone platform. If this is still the case, the first WP devices from Nokia will probably be pretty identical to competitors. Hopefully some of them will have at least as good camera as in Nokia N8 or N9. What would you like to see in Nokia’s Windows Phone Mango devices?